The food in this section are not STRICTLY 70s only food. We have food that were widely available for purchase DURING the 70s. This section was recently redesigned, so if you have any problems please let ChuckyG know. 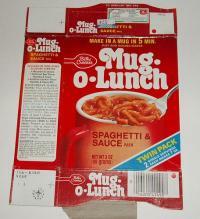 Are you an 70s food expert or just totally baffled by a leftover 70s food item in your possession? We have a page for Unknown 70s Food when you can send in your pictures, or help others identify their unknown food items. There are 1209 pages about food in this section. Select an index page to see the list of pages available. Click on an image to read more about the food item! Found a few images of the Polo Grounds, where the Giants played. One from 1955 shows a Chesterfield billboard ("It's A Hit! Buy Chesterfield"). Pabst was a national brand beer then, though had no New York brewery (one in Newark opened around 1962). Saw no signs for Hoffman's. I forgot to mention that I remember that Hoffman and Pabst sponsored New York Giants baseball games on WMCA radio, along with Chesterfield cigarettes. I was hooked on all the Hoffman flavors while growing up in The Bronx, but my favorite was Black Raspberry. I remember reading that the company was associated with Pabst Brewing, and there was a strike, which ended up driving the distributor out of business. The brand, with its formulas continued for a while; I remember Leewood Beverages distributing it in Westchester County in the '60s. I think it later made a comeback in cans, but not with all its flavors. The opening scene in Woody Allen's movie, Radio Days, has the family in Rockaway eating dinner with a big 26 oz. bottle of Hoffman Ginger Ale, prominently shown on the table. I also liked Hoffman Lemon, it was so superior to 7-Up. So many of us who were teens in the 70's have happy associations with Figurines. If they brought them back there would be an instant following! They could use an updated version of the same jingle (to tune of "Tangerine") for instant recognition. I ate my Mom's then because they were so delicious. Now I'd eat them to loose weight. Miss those so much! Somebody...? Got an idea for a page we don't have yet? Submit a picture of a food item we don't have a page for, or you don't recognize.